Utilizing our proprietary lentiviral vector systems, GenTarget has generated the LocLightTM Sub-Cellular Labeling Lentivirus product line. 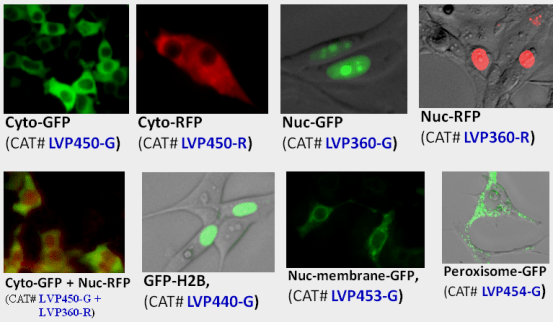 These premade lentiviruses contain a well-defined organelle targeting signal fusioned to a fluorescent protein (GFP, RFP, or CFP) and expressed under our proprietary suCMV prompter. The fluorescent proteins are non-toxic to cells, do not compromise cell structure, or interfere with signaling pathways. They are great tools for live-cell imaging and for dynamic investigation of sub-cellular signal pathways. The pre-made lentiviruses are extremely easy to use, and do not require any additives or substrates. Simply add the lentivirus into a mammalian cell culture. The expressed fluorescent protein will be localized to the specific sub-cellular compartments at 1-3 days post-transduction and can be visualized by fluorescence microscopy. See examples below. Each particle contains an antibiotic selection marker (Puromycin, or Blasticidin or Neomycin) under the RSV promoter, allowing selection of transduced cells. See the scheme below for the expression cassette structure. PBS solution, which is best for in vivo applications, cell cultures requiring serum-free conditions, or for hard-to-infect cells. High titer: GenTarget’s premade lentiviral particles demonstrate the brightest fluorescence signal and strongest transduction efficiency available. Robust: Particles are validated on a lot-by-lot basis and their quality is guaranteed. Versatile: Lentiviral particles can deliver fluorescently labeled targets into hard-to-transfect cell lines, such as primary or neuronal cells, for long term expression. Useful for multi-color applications: Different fluorescently labeled particles can be used together in the same cells. Very easy to use: Simply add into your cell culture and visualize the fluorescent at 48-72 hours. No need for any additives, substrates, components, cell washes, or medium changes. Please select your desired product below. Click to see Product Manual.